MILAN (AP) — Nowhere is the transition in the fashion world more evident than during the menswear preview shows in Milan taking place on the second of three days Sunday. Miuccia Prada observes a world becoming more “difficult, dangerous, boiling” and interpreting it through fashion. Prada’s looks mostly were done in black and navy, starting with elegant men’s suits first shown with the jacket casually opened, worn shirtless and having slightly cropped trousers that revealed bare ankles. Prints on shirts included lightning bolts and beating hearts placed with anatomical correctness, Prada’s nod to cheesy horror movies. The soundtrack included harder-rock versions of music from the “Rocky Horror Picture Show” and “The Addams Family.” Prada said she wasn’t necessarily a fan, but was fascinated that the writer who created Frankenstein’s monster, Mary Shelley, initially had to publish under her husband’s name. 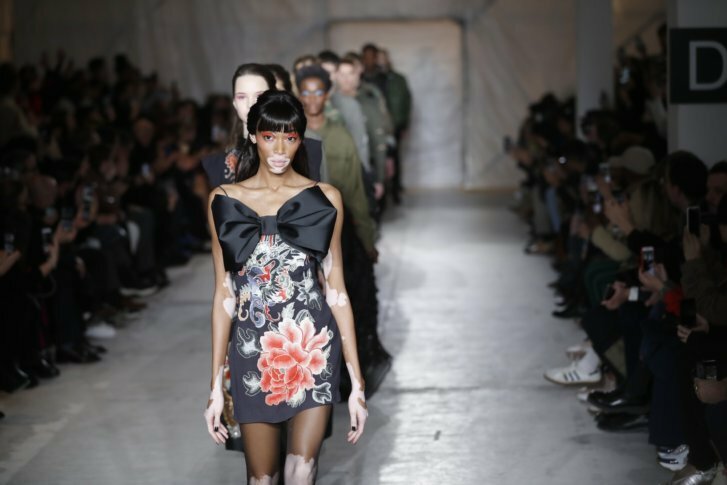 British designer John Richmond marked his return to the Milan fashion calendar with a co-ed collection featuring dark military looks for men and elegant 1940’s starlet-inspired dresses for women. “It is almost two collections. I am not trying to do one thing that works for men and for women,” Richmond said. Richmond embroidered Japanese tableaus on recycled military garments and bags for men and decorated recycled Levi’s with sequined wings across the hips for women. “We don’t have to make more jeans. There are already so many jeans in stock,” he said. Women’s dresses were extremely elegant, with pointy shoulders, deep V-necks and asymmetrical mini-hemlines. Richmond designed wedge boots with fringe detailing for women. The designer said his exhortation to reuse, recycle and reduce is not a one-off for this season. “This is a theme forever,” he said. The designer showed menswear and womenswear collections that he already started selling at the beginning of the year, grabbing buyers’ attention early. Consumers want the runway garments they see on Instagram immediately. By the time womenswear shows come around next month “it’s too late. Some buyers aren’t coming back anymore,” said Richmond, who splits his time between Naples and London. “Maybe in the future we will have shows that are more in season,” he speculated. The brand’s first fully co-ed collection featured an oversized wintery silhouette, with enveloping knitwear, sophisticated layering and entwining scarves, clashing at times with body-hugging dresses. “There aren’t even slogans or mottos (on the garments) anymore. In fact, there is a beautiful plain white shirt that symbolizes the idea we have now, ” Rizzo said. Giorgetti’s double-breasted overcoats weren’t so stuffy they couldn’t be worn with a hoody and layered with a furry parka. Bombers and overcoats featured manga cartoon prints. Washed-out denim jackets came lined with lambskin and paired with matching jeans.